OpenKore comes with a list of official servers information only, because of the high amount of private servers, it is impossible to have and keep them updated, so private servers players should follow this guide to get and update their server information. Before continuing, read the list of unsupported servers. Your server might have anti-bot protection resulting in not being supported by Openkore. There are detailed instructions on collecting server information with WPE or Wireshark. This kind of packet analyze isn't anything special for OpenKore or Ragnarok Online, so it's up to you to get the tools and ways to do it which work for you. It's up to you as well what to do with any so-called "protection" in your server's client that may get in the way. There may be problems determining version and master_version if your server's protocol has some kind of encryption. In that case, merely determining these values won't even help, the main issue is dealing with that encryption. 1. Download WPE and extract it. Before downloading, make a sure to disable your anti-virus as it can mark WPE as a virus and delete it. Download at your risk, we will not be resposabilized if your computer crashes. You will need some programs to extract it, the common ones are WinRAR and 7zip. 2. Open your ragnarok but don't login yet! Leave it on the login screen and open WPE. 3. 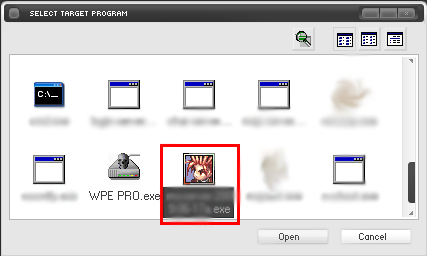 At WPE's window, click on Target Programs button. 4. A window will open, search for the server's executable and double-click it. Note. Some servers "hide" their executables by renaming it (like from xxxRO.exe to xxxx.dll or xxxxx.bin), so don't worry if the executable isn't a .exe one. 5. In the WPE's window, click on Play button. 6. Switch to your Ragnarok's window, put and try to login. Note. Valid login information are not needed. 8. A window will open with recorded data. One of the packets sent to the server would be login packet which usually contains the server's version, master_version, IP and port - write them down because they are going to be used later. The packets will be different on each server, possible login packets may start with 64 00 or 02 B0. Other packets (such as 18-byte-long 02 04) may be sent before login packet. 9. See Converting Hexadecimal to Decimal numbers to convert the master_version and version before configuring Kore. 1. Download and install Wireshark. 2. Open your ragnarok but don't login yet! Leave it on the login screen and open Wireshark. 3. At Wireshark's window, go to Capture > Options on the upper menu or press Ctrl + K.
5. Click on Start button and go back to the Ragnarok window and login. Note. Valid information are not needed. 6. Back to Wireshark and click on Stop button. 7. 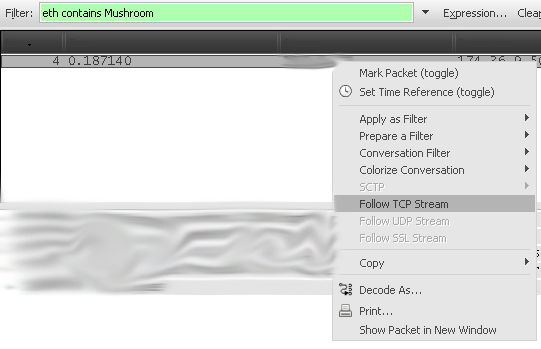 In Wireshark main window, you can see the TCP segments that were captured. Fill in the packet filter, but what to fill in depends on the username you used to login. Replace xxxxxx with the username that was used to login and press enter. In the example bellow, username was Mushroom. 8. There will be only one entry now, click on it to show some information about it. This is where the IP and port is stored. Write down the IP and port. 9. On the entry again, right-click on it and go to Follow TCP Stream. 10. A new window will open, in the bottom left, select Hex Dump. 11. These are the login packets. Take a look at it and write down the packets that contains the version and master version numbers. They are marked on the image bellow. 12. See Converting Hexadecimal to Decimal numbers to convert the master_version and version before configuring Kore. Master_version and server version collected from the login packets are in hexadecimal number (base-16) and Kore expects a decimal number (base-10), so converting those numbers are needed before Kore can read them. Converting can be made using Windows' calculator or any other site that has a hex to dec calculator. 1. Open Windows calculator Start > Accessories > Calculator. 2. Go to View on the upper menu and click on Scientific. 3. Check the circle beside Hex. 4. On the calculator, type the number that you got for master_version and version. In the example, master_version hexadecimal number is 10. 5. Check the circle beside Dec.
6. After checking, the number shown should automatically be converted from hexadecimal to decimal. You must convert master_version and version. OpenKore reads server information from a file named servers.txt. The file is on tables folder. If your server is not listed in the file, then add a new entry. If your server is already listed, then modify the existing entry. The name of the server that you want to bot. The name must be between [ ]. Developers: avoid changing existing server names, it disrupts configurations. Instead use title option if you need to change displayed title for a server. Server's version (converted from hex to decimal). Server's master_version (converted from hex to decimal). Server's type. Each official server has its own serverType, private servers must use kRO serverTypes according to executables dates. Length (in bytes) of data block describing each of your characters in the packet with character list (received_characters) on character selection screen. Correct value for a server may be not supported by a specific serverType or not supported at all, so merely trying values mentioned here may not be enough. New charBlockSizes are being constantly introduced. 2011-09-28 876acab "change slot feature"
Dates are for a reference with default Athena configuration only, any server can reconfigure that. In Athena code base, function mmo_char_tobuf generates character blocks. Implementation of this feature is expected to become outdated with server updates. As OpenKore is a free project, if you stumble upon such updates, you are expected to fix the problem and contribute your changes back. Usually, server supporters will do that, but there isn't any for random private servers, and some official ones may not always be covered. Configures Kore to load tables file from the specified path (relative to the tables directory). Used only when there is no --tables specified. Configure Kore to use the captcha 'protocol'. Enables support for language codes (a pipe and two hexadecimal digits) in chat messages. Used for GameGuard and HackShield. See also: Poseidon. Set this option if Openkore connects to a wrong map-server IP. Usually for private servers. Configures file's name for recvpackets. See also: Packet Length Extractor. Overrides master login packet switch (but not its structure). Required for XKore 2 if it's different from 0064. This page was last modified on 10 February 2019, at 12:33.